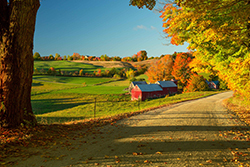 Barnard, Vermont is an outdoor enthusiast's dream! Barnard is home to Silver Lake State Park. The Appalachian Trail passes through Barnard on its way from Georgia to Baxter State Park in Maine. Whether you enjoy spending time on the water or time in the mountains, Barnard has something for you to explore. Scroll down to find all current real estate for sale in Barnard, VT. Contact us if you have questions or would like to learn more about a listing. Immaculately maintained classic cape home in desirable Barnard VT. The first floor has bright light, lots of windows, hardwood floors and an open floorplan with a chef's kitchen including cherry cabinets, quality stainless appliances and granite countertops, with extra bar area and sink with wine cooler. The kitchen opens beautifully to the family room with fireplace, open and inviting for family gatherings and entertaining. Nearby is the formal dining room and a separate living room with wood-burning fireplace. Upstairs is a private master bedroom suite with large walk-in closet and ensuite bath, a laundry room, plus two additional bedrooms with jack-and-jill bath and a large open office/play/game room. The attached two-car garage opens to a back mudroom for keeping all your Vermont boots, coats, scarves, gloves. Full concrete basement with excellent mechanicals including backup generator and 200-amp electric. The land component includes 19 acres of property located on a quiet side-road but easy access close to the Barnard General Store, Silver Lake, and 15 mins to Woodstock and I-89. Easy access. Beautifully maintained. Lovely landscaping and gardens for year-round enjoyment. The forest is ideally suited to the development of a private, year-round homestead property with features that include: · Twelve-minute walk to Barnard Village and Silver Lake; · Prime potential home sites with views of the village, lake and steepled church; · Highly aesthetic forest with ±6,250 potential maple taps; · Forest intensely managed since 1960 by current owner. The property is located just 12 minutes' walk from the center of Barnard Village, a tiny but culturally diverse community located in central Vermont. At its heart is 84-acre Silver Lake, which hosts seasonal and year-'round shoreline homes, a town beach and a state park at its northern end. Across from the lake is the Barnard General Store, a popular stop featuring local prepared foods. The village is an active and popular, four-season destination for locals and tourists alike, with lodging available at several bed and breakfast establishments. Woodstock Village is 10 miles to the south and the junctions of I-89 and I-91 is 32 miles to the southeast. Access is provided by roughly 145' of frontage along West Road, a graveled town road just off Route 12 with electric and telephone service roadside. A developed driveway runs between two neighboring homes as it leads into the property for ±325' to a small clearing. A quintessential Vermont home to enjoy the beauty of the landscape. Numerous double pane windows bring in the sunshine and provide great viewing of the abundant wild life active on this 5 acre property. Conscious of being energy efficient, the current owners had an energy audit performed by Efficiency Vermont and added the insulation required. EC Fiber is accessible in this location to provide high speed internet. Other amenities include a large, sunny deck, large timber frame style barn with metal i-beam and pored concrete foundation, garden shed and attached wood shed, full house generator, and buried power lines. 5 miles to Silver Lake in the State Park and the Barnard General store. A great property to enjoy the pleasure of living in Vermont. THE SUGARHOUSE Serenity awaits! What could be better than 50+ private acres in gorgeous Barnard, VT? How about 50 acres with a pond, a stream with a series of waterfalls, a spring, power, and well-appointed log cabin, plus a State -approved wastewater permit for a 7 bedroom home! This cabin in the woods is a converted sugarhouse, and it is both rustic and upscale at the same time. Currently used as a 3 season cabin, The Sugarhouse has its own septic, electric power, a wood stove and a backup generator. There is plenty of space to relax and enjoy this magical place. There are 2 loft bedrooms and even a laundry. A large firepit graces the side lawn. The land component of this property consists of a mix of hard and soft woods, and if you follow the woods road you will find a cleared area with a pond and further up an area identified as a house site with wastewater permit for a 7 bedroom house. The cabin is being sold furnished. If you have dreamed of a perfect slice of Vermont, this is it!